Burns Supper, Birthdays and a Boy in a Kilt. It's my half-birthday -- a celebration dear to the hearts of those born in the depths of summer, when no one could come to your birthday parties and you didn't even get to bring cupcakes to school to celebrate. January 25 is also a spectacular day because it's Burns Night! I did not get my act together in time to host the Burns Supper that I envisioned. I was going to haul out the good china, force people to RSVP and have a sit-down dinner. We would pour single malts from the crystal decanter on the mantle, explaining to our bourbon-loving friends that sometimes good whisky tastes like a campfire and that it's okay to like it. But my new attitude is to not be hard on myself for not having pulled off such an event. My mind has been on other things. I'm desperately trying to finish a new album before March, so that maybe just maybe I can actually put it out before the summer. And, like, tour and stuff. Maybe even tour in Scotland, where I can, perhaps, celebrate Half-Burns-Night on July 25. I was going to link you to some recipes, but I just re-read my blog from last year and determined that it's all you'll ever need for a perfect Burns Supper. So just read it! Snow Ice Cream and deep thoughts. Snow day! Which means no childcare, which means I can't work. 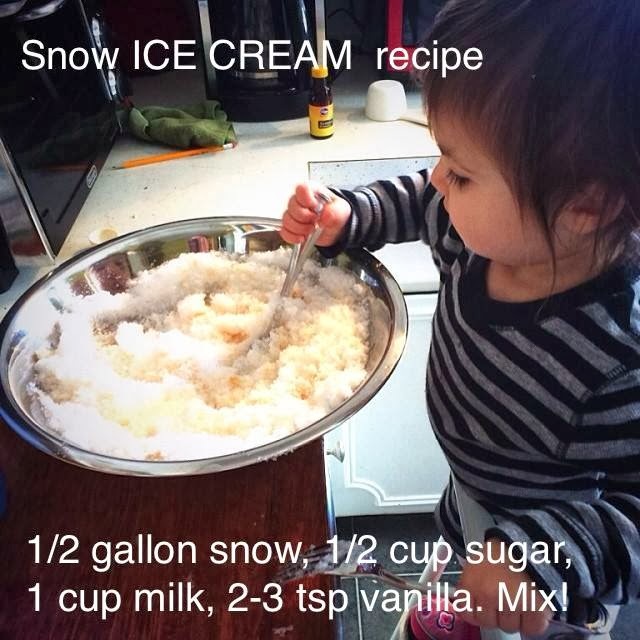 So I guess I had better make the best of it and make snow ice cream with my wee boy. Remember this recipe? It's still good. Enjoy! Or tuck it away on Pinterest for the next snow day. Also, from the title of this blog, I suggested I would have some deep thoughts. I thought that, maybe, by the end of this writing, I would be doing some serious philosophizing. I am not. Sorry for the false advertising. The enemy of an organized life: Little Pieces of Paper. Little pieces of paper. They (used to) fill up my purse, my counter, my dining room table, various envelopes -- all because: TAXES. It's January 13, which means two days until you make that big decision: pay your 4th quarter estimate taxes or buy a plane ticket to Paris. If you don't know what I'm talking about, then you are not self-employed. Which is a good thing because you likely also get benefits like, say, health insurance options, a regular paycheck (a paycheck with taxes already taken out! ), a schedule, paid vacation and maternity leave. But you also have to ask someone else permission to take a day off. For me, that is the trump card of self-employment. If I do decide to go to Paris on Friday, that's on me. Today's blog is for you self-employed folks who aren't quite profitable enough to afford a bookkeeper. Or for you regular folk, who are just tired of saving receipts. 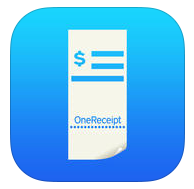 I've been using an app on my iPhone called OneReceipt for the past 9 months. It isn't perfect, but it's the software I've been waiting for for 15 years. For me, it's been life-changing. The most annoying part of tax preparation is organizing all my receipts into categories that fit neatly into the Schedule C. If it were just a matter of calculate-total-expenses, that would be easy enough. But keeping my advertising receipts separate from my supplies, separate from my travel, separate from my parking, separate from my business meals, etc., well, it's just been a headache, no matter what my system. I've done everything from shoeboxes, to accordion files, to envelopes, to QuickBooks, to an Excel spreadsheet. It's hard to be consistent when the enemy is, truly, little pieces of paper. I wish the Schedule C categories were pre-programmed into the app, but I can't have it all, I suppose. I have just been creating tags as I need them, snapping a photo of the receipt within the app, throwing that stupid little piece of paper away, and trusting in the cloud. (I know, I hear your hesitancy, but I'm full-in with the technology.) The wonderful thing is that right now, I just need to go to the website, sign in, check the box that says "Advertising" and I get a sum total of all the advertising receipts, without having had to keep up with a spreadsheet all year. Anyway, I meant to have this piece of advice for you self-employed folks at the end of December. But it's still only 2 weeks into the New Year. Rid your lives of little pieces of paper! And, no, I'm not getting anything for endorsing this product. I just happen to really love it. 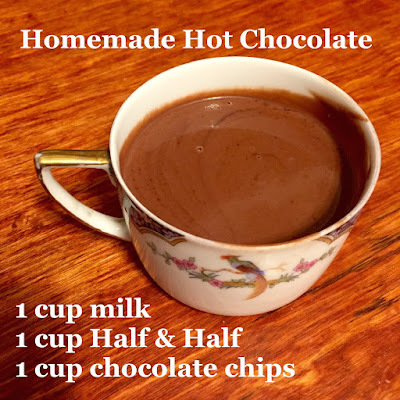 Easy, amazing homemade hot chocolate recipe. It's been three years since we moved back to America, and I still miss Scotland like crazy. One of the biggest things I miss is accessibility to the rest of Europe and the little ethnic shops run by actual immigrants ... like, the amazing Italian coffeeshop in Stockbridge run but actual, real-life Italians. In particular, I miss the Chocolatissimo! On one level, it's just hot chocolate, but that's kind of like saying a 30-year-old Laphroaig is "just Scotch." So, while David and the wee boy were freezing their adorable tushes off making snow angels last night, I stayed inside and attempted to re-create Chocolatissimo with whatever we happened to have in the cupboard. I used almond milk, not real milk. I did use real Half&Half. I also used about 3/4 cup semi-sweet chocolate chips, but then I used 1/4 cup of of a broken dark chocolate bar. You could add a splash of vanilla and a dash of sugar if you like, but it's not necessary. Boil the milk first, then stir in the chocolate. So so so so so good. I'd also recommend a serving size of 1/2 cup. It's very rich. Also, Louisville friends, swing by Mama's Hip on Wednesday morning for Family Music Jam! 10:30am, drop-in class. $10/family. 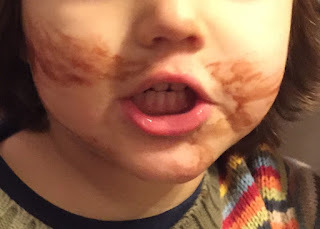 Why I let my 3-year-old use the good china. It's the first day back from winter break -- the toughest Monday of the year, following weeks of presents, cookie-making, spontaneous trips to the playground or pool, parties and staying in our pajamas for days at a time. 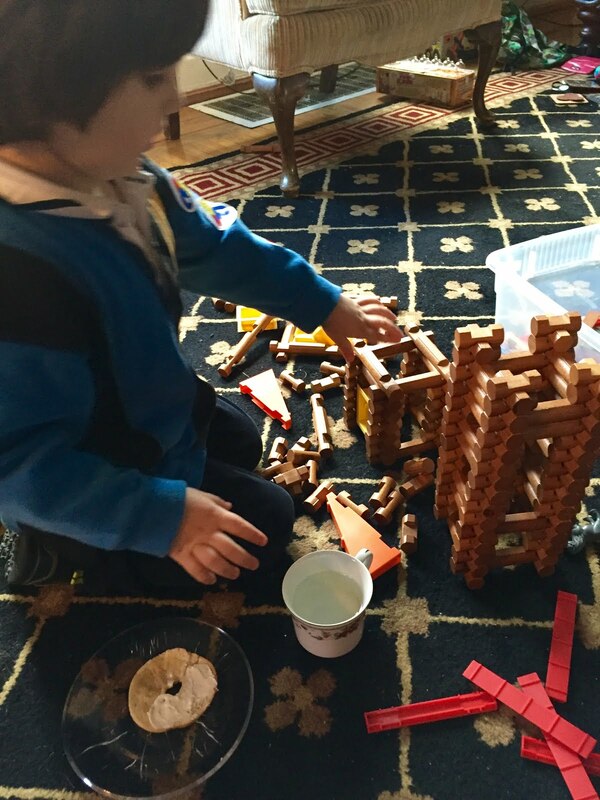 My wee boy was, um, disheartened, to say the least, at the idea of returning to preschool. I've since picked him up from that long day back at school and my long day back at work. We are now playing Lincoln Logs and sipping tea together ... from the good, vintage, yes-they-were-my-grandmother's teacups. We had a tea party last week with three other children, each only slightly older than my child. I could see fear on the mothers' faces when I delivered the herbal tea in the fragile cups*, but I declared, "It's okay. It's my fault if they break. But what good are the dainty, beautiful vintage cups if all they do is decorate the china cabinet?" It's optimistic of me, I know. Truthfully, I'm prepared to lose a few cups here and there. But I'm on a mission of positivity and enjoyment. I don't want to spend years waiting for the day when my boy will be able to properly sip tea out of Grandmother's china. Is this what they call living in The Present? If so, I think I like it. Happy new year, friends. Break out the good china. *Not all the tea was consumed (plenty of, "Yuck! I don't like tea! "), but all the teacups remain intact.